Nearly 10,000 soldiers of the National and Confederate armies clashed on May 20, 1864, around rustic Ware Bottom Church in Chesterfield County, Virginia. Chesterfield County is located in the Richmond-Petersburg region in the Commonwealth of Virginia. Before the day concluded, 1,400 dead and wounded men from fourteen American states lay sprawled and bleeding upon the ground. This climactic battlefield of the Bermuda Hundred Campaign was overshadowed by larger events of the time and lapsed into relative obscurity. Why? Because the Battle of Cold Harbor immediately followed the Battle of Ware Bottom Church. Today, the battleground itself has all but disappeared. 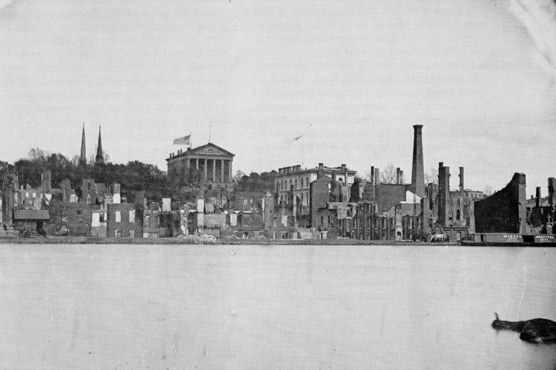 Richmond, Virginia, was at the heart of the conflict. As the industrial and political capital of the Confederacy, Richmond was the physical and psychological prize over which two mighty American armies contended in bloody battle from 1861 to 1865. Topographical engineers were the eyes of the armies during the American Civil War. Using simple, but effective, tools and techniques, they scouted the territory, recorded measurements, and produced and reproduced thousands of maps to guide military operations. Scales and skills varied, but many of these maps contained surprisingly accurate depictions of the terrain, roads and railroads, farms, fields, woodlots, and fortifications. A historic map can be a valuable tool for finding and documenting cultural resources in the field. By plugging real-world coordinates into the digital image using the ArcGIS georeferencing tool, a historic map can be overlain in GIS with modern data layers. To rectify this map of the area around Ware Bottom Church, we used road intersections, points along the railroad, and the locations of known structure sites and fortifications collected with global positioning systems. Map features were then digitized onscreen, creating separate layers for structures, roads, woodlots, and fortifications. Overlaying these features with modern topography, rivers and streams, allows us to visualize the historic landscape. Features on this map are symbolized according to their current condition. Standing structures are depicted with a green dot. Structures that no longer survive are shown with a black diamond. The original historic fortifications are shown with a solid brown line. Sources: National Park Service; Official Records of the Union and Confederate Armies. What twist of logic must have inspired a citizenry--many of whom never owned slaves--to plunge into one of history's bloodiest conflicts? Visit Richmond in its proudest moments, when it envisioned victory; visit Richmond in its darkest times, when it felt flames. Their back to the Chickahominy River and on their last legs, the rebel troops defiantly face an army-wide assault ordered by Grant that extends over three hellish days. Rhea gives a surprising new interpretation of the famous battle that left seven thousand Union casualties and only fifteen hundred Confederate dead or wounded. Here, Grant is not a callous butcher, and Lee does not wage a perfect fight. Every imaginable primary source has been exhausted to unravel the strategies, mistakes, gambles, and problems with subordinates that preoccupied two exquisitely matched minds. In COLD HARBOR, Rhea separates fact from fiction in a charged, evocative narrative. He leaves readers under a moonless sky, Grant pondering the eastward course of the James River fifteen miles south of the encamped armies. About the Author: Gordon Rhea is the author of three previous books, a winner of the Fletcher Pratt Literary Award, a frequent lecturer throughout the country on military history, and a practicing attorney. The city's fall ushered in the birth of the modern United States. Lankford's exploration of this pivotal event is at once an authoritative work of history and a stunning piece of dramatic prose. About the Author: Nelson Lankford edits the Virginia Magazine of History and Biography, the quarterly journal of the Virginia Historical Society. He has written and edited several books. Among the more memorable key-players are Early, the daring general of the valley; Lew Wallace (who would later author “Ben Hur”), who attempts to block Early's advance; and George Davis, from Vermont, who was awarded the Medal of Honor during this fiercely contested campaign. This is a fine recounting of a relatively obscure but quite interesting series of events, and both the general reader and Civil War aficionados will enjoy it. The book also contains sixty-one illustrations. From John Brown's raid to Reconstruction, Eyewitness to the Civil War presents a clear, comprehensive discussion that addresses every military, political, and social aspect of this crucial period. In-depth descriptions of campaigns and battles in all theaters of war are accompanied by a thorough evaluation of the nonmilitary elements of the struggle between North and South. In their own words, commanders and common soldiers in both armies tell of life on the battlefield and behind the lines, while letters from wives, mothers, and sisters provide a portrait of the home front. More than 375 historical photographs, portraits, and artifacts—many never before published—evoke the era's flavor; and detailed maps of terrain and troop movements make it easy to follow the strategies and tactics of Union and Confederate generals as they fought through four harsh years of war. Photoessays on topics ranging from the everyday lives of soldiers to the dramatic escapades of the cavalry lend a breathtaking you-are-there feeling, and an inclusive appendix adds even more detail to what is already a magnificently meticulous history. Recommended Reading: Trench Warfare under Grant and Lee: Field Fortifications in the Overland Campaign (Civil War America) (Hardcover) (The University of North Carolina Press) (September 5, 2007). Description: In the study of field fortifications in the Civil War that began with Field Armies and Fortifications in the Civil War, Hess turns to the 1864 Overland campaign to cover battles from the Wilderness to Cold Harbor. 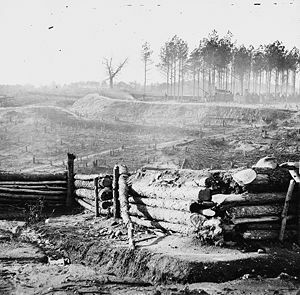 Drawing on meticulous research in primary sources and careful examination of trench remnants at the Wilderness, Spotsylvania, North Anna, Cold Harbor, and Bermuda Hundred, Hess describes Union and Confederate earthworks and how Grant and Lee used them in this new era of field entrenchments.